Advanced industrial societies are becoming aware of the impact of what they do to the physical and biological environment, and also what that environment does to individuals. 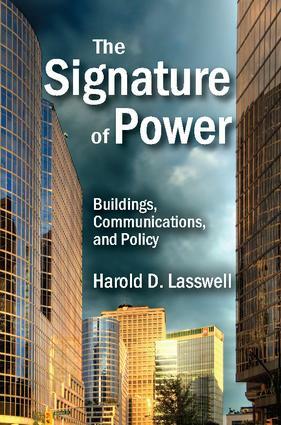 In The Signature of Power, Harold D. Lasswell examines the symbolic use people make of their surroundings and the complexity of the way they interpret an altered environment. Transformed habitats can change experiences and behaviors. All people seek to maximize their preferred events, such as power and wealth, when they use the environment�be it through glass skyscrapers or Gothic estates. In all cases, physical structures give expression to the perspectives of influential individuals and groups.This volume considers the complex interplay between the material and the symbolic. Physical changes introduced for political purposes by architects, planners, and engineers are guided by the perspectives of designers. These and other interactions in human society are simultaneous acts of communication and collaboration. Regardless of whether physical resources are used to transmit messages, such interactions nevertheless have a degree of communicative impact.Physical structures may be profoundly affected by the purposes, assumptions, and identities of those people who plan or change them. Environmental design, says Lasswell, is an instrument of political power.